Many of the modern products that are a part of everyday life have gone unnoticed because they are commonly used until little thoughts are given to their existence. Have a look around in your home , workplace and such and probably you will find many things are made from plastics from small toys to the automobiles. In short, plastic play a vital role in the modern world. 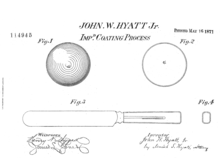 The first injection moulding was invented by John and Isaiah Hyatt in 1872. The earliest of injection moulding resembles a large hypodermic needles with heated cylinder on back which forces the heated gooey materials into the awaiting mould. Nowadays, the technology have matured and allowed for different formulations and techniques for injection moulding. Injection moulding method are suitable if there is a large number of parts are to be produced. The only disadvantages are the initial start up costs especially the injection moulding machine as well as tooling for the mould. Therefore from this Handbook of Plasting Molding and Manufacturing, it is hope that you will gain an quick overview on the plastic moulding and manufacturings. In the chapter 3, we will learn what are the plastics are. In Chapter 7, the common defects for moulding process usually causes from machine, mold, material and man (operator). In this section, we will learn the causes of these defects as well as solutions to solve this problems.